My Klondike bar – thanks. How’s business? That bad, huh? I heard it was going a bit harder than usual. How are Ziva and McGee doing? When are you going to quit calling him McGeek? Yes, it’s cute, to me. I’m not so sure he likes it. As for Ziva, I think you two are giving each other the look. All right, all right! Don’t get so ruffled, I was just giving you my opinion! Okay, okay, fine. I’ll cut to the meat of the matter. Gee, they’re making these Klondike bars smaller all the time. That one didn’t last a light-second. Now, where did I want to start this? Oh, yeah. So the focus of The Hobbit: An Unexpected Journey is, naturally, Bilbo Baggins. Throughout the film we see his growing affection for the dwarves in the company, and their growing respect and friendship with him. But there’s one dwarf who just doesn’t seem to soften toward Bilbo in the least, although Bilbo’s admiration for him continues to grow. Thorin Oakenshield, the dispossessed dwarf king, is stiff with all the company (save perhaps with Balin), but he is especially gruff with Bilbo. Proud and battle-tried, Thorin is determined to regain his near-crazed grandfather’s kingdom under the mountain, which is guarded by a firedrake (dragon). But the entire might of Erebor in its greatness couldn’t stop Smaug the terrible. He’s going to need help. And for this mission, the only help Thorin’s got are twelve other dwarves. Oh, sure, Gandalf travels with them fairly often. But he’s a wizard; he has a lot of other matters on his plate. He can’t travel with the dwarves all the time, and even if he could, an entire army couldn’t drag Smaug out from Under the Mountain. What’s Gandalf the Grey (even with all his power) going to be able to do – other than give Smaug a stomach ache? These odds are beyond dismal to start with. There’s worse in that, since Gandalf isn’t a reliable traveling companion, it leaves Thorin with a company of thirteen. You know the old saying about thirteen being an unlucky number. Who wants that worry hanging over his head on an already badly outmatched mission like this? 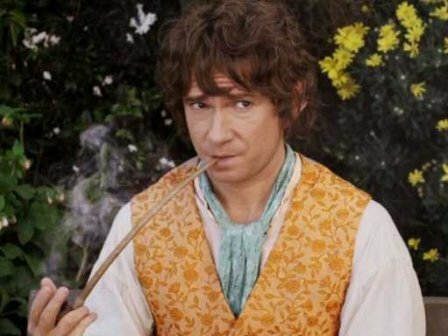 Bilbo has, of course, never used a sword, axe, or any other weapon. It’s doubtful that he ever even used a sling shot as has Ori. In fact, I think it was mentioned in the book that the only thing he knew how to do was throw rocks. Not an especially helpful talent when you’re facing a huge dragon, huh? As for burglary – only Gandalf’s quick interruption kept Bilbo from letting slip that he’d never stolen anything more than fruit or vegetables in his whole comfortable life. How is he supposed to steal anything from a dragon? It’s shown later that he has trouble stealing from mountain trolls. Doesn’t inspire confidence about his ability to get past a dragon, does it? And herein lies part of the rub. Thorin has led an uncomfortable life for many, many years. He’s fought orcs, wargs, and lost his home to a dragon. He has had to work for the clothes on his back and the weapons he carries. His father has gone mad and vanished; his battier grandfather was slain in a horrible manner right in front of him, and he has led and lost thousands of dwarves in war against the orcs of the Misty Mountains. All of this happened in one day. He has had years to brood on it and get bitter over it. And when he finally gets the chance to do something about it, he finds he doesn’t have enough dwarves. Although as he himself points out, the dwarves he does have are willing to fight. That can be the tipping point in any battle. But when he asks Gandalf to get him a burglar, Gandalf instead finds him an untried hobbit who has never seen battle. Heck, he hasn’t even lifted a sword at any point in his life!! For Bilbo’s part, as a young hobbit he probably would have jumped at the chance to go with the dwarves. But at the hobbit’s middle age of fifty, he has had time to get comfortable with the quiet life of the Shire. He is “respectable” and doesn’t do anything considered odd by the residents of Hobbiton. Suddenly, his quiet, comfortable life is turned upside down in one night. A passel of dwarves invades his home, sets it into absolute disorder, the lead dwarf insults him, and he is “volunteered” to go on a quest. The “respectable” part of Bilbo does what any “respectable” resident of Hobbiton would do; he turns it down. The next morning he finds his house – the one thing he takes real pride in – restored to its former order and cleanliness. And on the table in the parlor, he finds the contract to join the company. Wonder who left it there? I doubt it was Thorin. Balin? Perhaps. The more likely answer, I think, would be Gandalf. Now, this is the second half of Thorin’s problem with Bilbo and, frankly, with a great many other people. 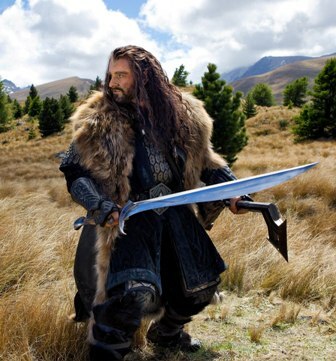 Thorin is the dwarf king and has earned glory in his battles. He has helped his people survive since the fall of Erebor. And, in typical dwarf fashion, this has all gone straight to his head. Dwarves in Middle-earth are known for their bull-headed pride. Only Gimli ever seemed to have any sense in that regard, keeping his pride under better control than many other dwarves. Thorin doesn’t seem to even want to keep his pride in check. Thorin’s pride brings the company to many of the dangers they encounter. He chooses to camp at the wrecked farm, near a troll den; he bickers with Gandalf regarding most of the wizard’s advice; and at first refuses any help Elrond can give him because Thranduil, king of the Mirkwood Elves, wouldn’t attack Smaug when the dragon was safely inside the Lonely Mountain. Yeah, Thranduil may have been a stuck-up snob, but what’s the sense in getting his army killed in a suicide attempt? Somehow, Thorin never seems to figure out this part of the equation. At least he doesn’t in this movie. Only Gandalf’s frustrated tirade gets Thorin to finally – grudgingly – accept Elrond’s help in reading the map his father Thrain left him. Bilbo’s pride is of another type. Bilbo takes pride in being “respectable,” in how well his hole is taken care of and, essentially, in being a hobbit. This pride is really nothing when compared to Thorin’s, and because he can take no pride in these ‘small’ accomplishments on the trail, Bilbo sets it aside (until later). This is what gives him an edge that Thorin at first doesn’t see and later ignores: Bilbo learns as he goes along on the quest. He learns to use his wits, his sharpest and best weapon; shown when he successfully distracts the trolls, and engages Gollum in a game of riddles. He learns how to use a sword and how to fight. And, most importantly, he learns when to use a sword and when not to use a sword when he spares Gollum (as Gandalf advised was the true sign of bravery). He learns how to be a good friend to all the dwarves, even Thorin; although the dwarf king refuses to even consider him a friend for most of the film. Why does Thorin do that? Because, Tony, Bilbo may be high on the hobbit totem pole, but socially he’s inferior to half the other races in Middle-earth. Bilbo’s no warrior; he’s not a smith, not an archer, he’s not even a scholar. He has no credentials outside of the society of the Shire. He shouldn’t even be loyal to the exiled dwarf king; he’s a hobbit and Thorin’s a dwarf. Why should either of them care what happens to the other? Why should Bilbo care about what Thorin and the other dwarves want? It may be safe to say that Thorin doesn’t care terribly much about what Bilbo wants. He has come to see that Thorin and the others lack what he has – a home, a home that they can be proud of, as he is proud of his hobbit hole. 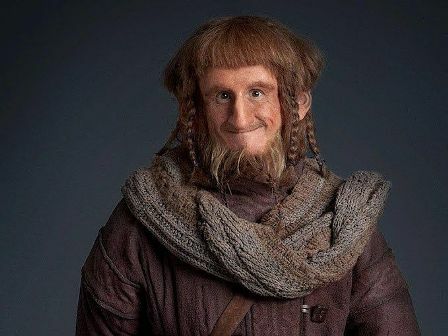 In the Shire, everyone has a home that they can be proud of; I don’t believe there’s any such thing as a homeless hobbit in the entire Middle-earth world. So it stands to reason that he would want to help the dwarves regain that pride. And finally, Thorin wakes up to the fact that Bilbo really does want to help. Oh, yes, Bilbo misses the Shire and wants to go back. He doesn’t enjoy the rigors of the trail, no. He doesn’t like fighting for his life against orcs and wargs. But if that’s what it takes to help his friends, then he’ll do it. He’ll put up with the discomfort and see the journey through to its end. Come on, Tony, who wants the end of the journey to be the final end? But the thing is that the future isn’t written in stone. Bilbo is willing to risk his life, maybe more than he realizes, to help his friends get their home back. And that is why he gives Gandalf courage. Well, I have to split. See you around, Tony! This entry was posted in Movie Reviews and tagged Bilbo Baggins, Dwarves, Gandalf, Hobbit Sense, Movie Reviews, Pride, The Hobbit, The Hobbit: An Unexpected Journey, The Shire, Thorin Oakenshield on July 9, 2013 by The Mithril Guardian. You will have to buy me a Klondike for as long as I deem it necessary, Tony. Next crack about a book and I’ll have to think of a worse punishment. There’s those cat’ o’ nine tails, and then there’s the rack. Nasty, nasty torture device; I know plenty of characters stretched out on it right now, too. Sad, I like most of them, and I’m not the one who put them there. If you seriously find those torture devices of too little severity after watching Brave, then I suppose I could always sign you up for rock climbing lessons. Then there’s parachute jumping – but you already did that one. Weeell, when you offer me a month of Klondike bars, I guess I could leave it at that. All right, it’s a deal. Right, to business then. So, this note is about the most innocent dwarf in Thorin’s company. He’s the youngest, and youth and innocence tend to go hand in hand (at least they do in stories). His name is Ori. Now notice – notice! – he is the only dwarf to ask that. All of the dwarves have tramped into Bilbo’s hole, “pillaged the pantry” as he himself put it, and have set the rest of his house in absolute disorder. And here comes the youngest dwarf to ask about his dirty plate, like any child at a dinner party that isn’t sure of his manners. I guess it’s a good thing that Bilbo never got to answer him. Heaven only knows what he’d have said! Next, during the song “Blunt the Knives,” Ori is tasked with putting the clean plates on the table. He has to carry them – stacked so that they’re over his head – to the table without dropping and breaking one. No one helps him because they’re busy cleaning everything up (and having a little fun with him, too, I think). As he goes, Ori keeps his eyes on the stack, obviously worried that he may drop a dish. Luckily he doesn’t. Another indication of his innocence is Ori’s weapon of choice. Most of the dwarves carry axes or swords. I believe Bifur has a halberd, and all Bombur seems to fight with is his ample stomach. 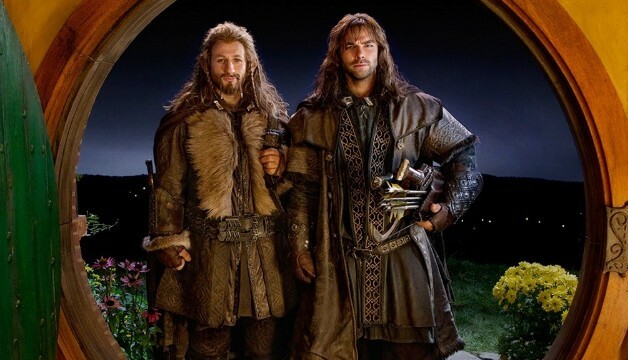 Kili appears to be the only dwarf with a bow and Thorin carries the Elf blade Orcrist, or Goblin Cleaver. And what does little Ori wield? Ori’s only weapon is a small sling shot. He may have a sword, but he doesn’t seem to use it much. He fires at an orc chief on his Warg just before Gandalf leads the company to Rivendell’s back door. The stone hits the Warg in the snout and the monster merely shakes its head, the way it would if a fly had just bitten it. David (of Goliath fame) Ori is not. On top of this, all the other dwarves seem to be protective of him. After Bilbo, he is the one they make sure to keep a close eye on. Thorin sends him into the cave that leads to Rivendell after he fires at the orc with his slingshot, and only when the Great Goblin under the Misty Mountains suggests that they start torturing Ori first does Thorin respond to the orc’s questions. Orc is the hobbit word for goblin, Tony. Oh, brother. You know you could at least look these guys up on the Internet if you’re that against reading the book. Anyway, back to Ori. When the dwarves get cornered in the trees of the forest at the foot of the Misty Mountains, Ori is helpful in tossing burning pine cones against the Wargs. When the tree that Ori and the rest of the company have been forced to share starts to fall, Ori is nearly their first casualty. Only Dori’s quick grab saves him from being a greasy spot on the ground. And later, only Gandalf’s staff is keeping the two of them from becoming dwarf blotches. This is another sign of how protective the company is of their youthful member. It’ll be interesting to watch where Ori goes from here. He didn’t get a lot of screen time in the theater cut of An Unexpected Journey, and that doesn’t appear to be likely to change in The Desolation of Smaug. But the only way to find out is to watch the next movie. Of course I’m going to watch it. You didn’t think that I only went to the theater to see this one movie, did you? Ugh. You know something, DiNozzo? You are incorrigible. I have to go. Next time we talk about Thorin and Bilbo. What? I wanted to make sure I had my opinions on their friendship (or lack thereof) thought out properly first! Oh, get out of here or I will make you take up jogging for a month! This entry was posted in Movie Reviews and tagged Bilbo Baggins, Dwarves, Gandalf, Movie Reviews, Ori, The Hobbit, The Hobbit: An Unexpected Journey, Thirteen Dwarves, Thorin Oakenshield on June 23, 2013 by The Mithril Guardian.